CARE International UK was named as a Heathrow charity partner in October 2018. The ambitious two-year partnership will enable Heathrow passengers and colleagues to support entrepreneurs living in poverty around the world, through the Lendwithcare initiative. Lendwithcare is CARE’s innovative online lending platform that enables people to give entrepreneurs much-needed access to credit and training. Since its launch, Lendwithcare has facilitated over £20 million in loans to 95,000 people (over 80% of whom are women). These entrepreneurs have in turn supported 380,000 family members and created employment for 23,750 community members. Donations collected at Heathrow will be directly invested in entrepreneurs. Once initial loans have been repaid by the entrepreneur, the donation will be reinvested to expand Lendwithcare, so that thousands more people can improve their lives. Heathrow is Europe’s biggest airport, welcoming over 78 million passengers a year. Collection points are located across the airport in departure lounges and baggage reclaim halls. Heathrow colleagues will also support the partnership through fundraising events including the airport’s annual Midnight Marathon which sees relay teams run 26.2 miles on Heathrow’s northern runway in the middle of the night. The new partnership between CARE International and Heathrow is about connecting people who are travelling all over the world, with entrepreneurs around the world. I have seen the impact of Lendwithcare for myself. I’ve met many people who have been able to grow their small business, and use the profits to send their children to school, buy more nutritious food, or make home repairs – the whole family benefits. 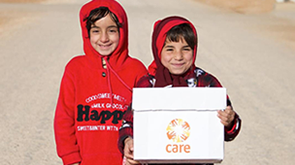 We are inspired by the fantastic work that CARE does for communities across the globe and are pleased to have them as our new international charity partner. The Lendwithcare initiative is an innovative way of helping some of the poorest communities enjoy a better quality of life through a programme that is sustainably focused with real long-term benefits. We have some of the most generous passengers and colleagues who I know will get behind this great cause.